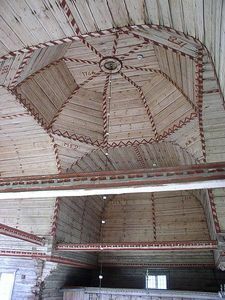 The Petäjävesi Old Church is a wooden church located in Petäjävesi, Finland. It was built between 1763 and 1765, when Tavastia was still a part of Sweden. The bell tower was built in 1821. It was inscribed in 1994 on the UNESCO World Heritage List. The church is located about 1 kilometre to the west of the centre of Petäjävesi. The church went out of use in 1879 when the new church was built. The old church has retained its original appearance and its interior decoration exceptionally well. It is a popular church for weddings in the summer, and there is a church service on most Sundays.